Looking for a personalised kids fleece jacket this winter. Look no further. We have a great range of colours and sizes available. 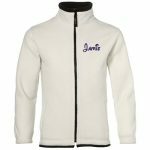 Our Kids fleece jacket can be personalised with your little Girl's or Boy's name in a cool colour and font of your choice A great gift for birthdays, special occasions or just to wear everyday, one jacket for all occasions.